Home » Notable» Four Year Old Visits Heaven...And Comes Back! It’s five years since Sonja Burpo’s son, Colton, fell ill during a family holiday. Her husband had suffered kidney stones, a broken leg and a cancer scare so the family were looking forward to getting away. "Little did we know it was going to be probably the worst time of our lives," Sonja recalls. "He definitely had a heaven experience." When Colton fell ill, the family assumed it was flu, but after a trip to hospital they discovered his appendix had burst. "He was very ill. We didn’t know if that was the last time we would see him. We spent another 15 days in the hospital, another surgery and ICU. It was touch and go. Eventually we were going to have to go to a bigger hospital - then he finally had a turnaround after a prayer meeting. "He never flat-lined, but he definitely had a Heaven experience because of what he’s told us. You can’t deny it. He actually told us in the hospital, but we were so tired and emotionally drained that we weren’t listening. He was telling us all along. Even after the hospital he was telling us and at first we just didn’t get it." He definitely had a Heaven experience because of what he’s told us. You can’t deny it. Eventually, Colton’s parents realised their four year old had been through a supernatural experience. Colton gradually began to speak about meeting in Heaven with his miscarried sister - whom he knew nothing about, and his great grandfather - who died 30 years before Colton was born. His parents were astonished. Descriptions of a Heaven filled with colour and rainbows have inspired the millions who have heard Colton’s story. There are now over 5 million ‘Heaven Is For Real’ books in print. Related products have followed including the devotional Heaven Changes Everything, the Children’s Picture Book, Audiobook and DVD Study. You can even buy the T shirt! Predictably, Heaven Is For Real has attracted critics who claim the family is trying to profit from Colton’s experience. But Sonja says the family have refused a lot of offers. "If we wanted to make money, there would be more yellow out there!" she says. Sonja is amazed that the book has done so well. It’s been two years since it was released but the invitations to speak and make media appearances still flood in. "We were hoping we could sell the first printing, and if we did we thought that would be great. When they continued to re-print, we had to think how they packaged it. Then the foreign licenses started coming in. We weren’t prepared. We get letters, emails and Facebook posts and we’re realising it has impacted and translated to other cultures." There are sceptics out there - you don’t focus on that. We focus on the people who are being helped. Sonja explains that it took time to get the full story from Colton. “He’s a boy and boys don’t like to talk,” she says. "To get anything out of him we had to be in the right moment. For the Heaven is for Real book, we were able to do things like we were drinking from a water fountain - a sip here and a sip there. Then we finally put it all together. When people read the book, it’s like drinking from a fire hydrant! In between two and six hours, people can read it all - and it’s a lot to take in at once." The book has attracted both praise and criticism from the Christian community. Popular blogger and associate pastor at Grace Fellowship Church in Toronto, Tim Challies, wrote: "Reject this book. Do not read it. Do not believe it. And do not feel guilty doing so." Others have called it: "Naïve, superficial and disturbing." But for every critic, there’s a handful of fans. Sonja rejects claims that the book is unbiblical and says her family’s faith has the Word of God at its foundation. The mother of three even thinks her son has even more revelations "locked up" in his head! The success of the book has had a huge impact on the family, but Sonja is determined to keep life as normal as possible. "That’s my job as the Mum," she says. It's difficult to know what ‘normal’ means for a mother whose son has been through a remarkable supernatural experience. Sonja has had to deal with criticism, national and international media and a hectic travelling schedule. All things considered, she seems remarkably calm, confident and full of faith. Many reviewers admit to being sceptical at the beginning of Heaven Is For Real. Even Colton’s own parents found the story difficult to believe at first. But somewhere between the 1st and 163rd page, Heaven Is For Real wins over a remarkable number of people – both Christians and non Christians. 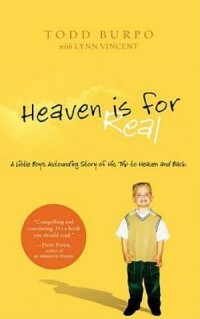 Thanks to the success of the book, it's not just Colton and his parents, but millions around the world, who are now happy to declare: "Heaven is for real"
I've read this book and it's well written, honest and credible. You cannot take away someone's testimony or experience and a little boy has no reason to invent hype or try to win acclaim. I'd recommend reading it before commenting. His parents come across as balanced, ordinary Christians (not extremists or weirdos! ).